Some unsung professions simply don’t get the spotlight they deserve. It’s obvious we need talented doctors, dentists, and teachers. But there are other indispensable professionals who have amazing mental processing skills in essential positions. A court reporting career showcases those stars. Planet Depos offers an incredible career path in court reporting. Along with lawyers, court reporters are the lifeblood of the legal discovery and depositions business! We are shedding a light on the basics of court reporting and the court reporter career outlook. We aim to inspire and locate the talent to pursue this career or encourage another excellent fit. A court reporter, also known as a stenographer or shorthand reporter, transcribes the spoken word/testimony at court hearings, depositions, trials, arbitrations, or any official proceedings. 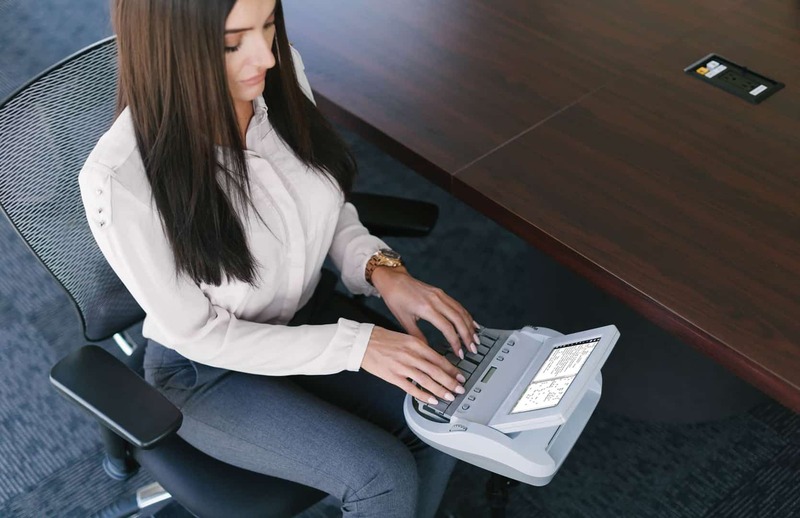 While there are several types of tools and technology used to record, the primary method is a steno machine, a word processor with a modified 22-button keyboard, upon which words are “written” phonetically. Why are court reporters so important? Think of court reporting and its impact on society. At Disney’s EPCOT, there is a ride called Spaceship Earth, which takes riders through the history of the civilization. One of the very first things seen is an ancient Phoenician recording history in shorthand. From early civilization to now, recording history has been essential to building society. Court reporters are an integral part of the legal process. They are responsible for recording and preparing verbatim transcripts of proceedings to be used by attorneys, judges, and litigants. Court reporters also serve the deaf and hard-of-hearing communities by providing realtime captions for live television programs, as well as one-on-one personalized services in educational and public environments. How long is a court reporting program? Typically, court reporting schools are 2- or 3-year programs, but it can take up to 3 to 5 years to complete the court reporter training coursework. It is highly dependent on the amount of effort put into developing the skill set to become a reporter. Check out the list of certified schools and programs on file with the National Court Reporters Association (NCRA) to find the right fit for you! Is certification required for a court reporting career? In some states, certification is required; in others, not. The most recognized certifications are those offered through the NCRA. The entry-level Registered Professional Reporter requires passing a skills test with 95% accuracy at 225 words per minute. There is also the advanced Registered Merit Reporter certification, which requires 95% accuracy at 260 words per minute. According to the NCRA, the highest level of certification available is Registered Diplomate Reporter. The Diplomate Reporter differentiates advanced, veteran reporters as the elite in their profession. What personality traits and/or interests do court reporters typically possess? The court reporter’s primary responsibility is to record the spoken word as quickly and as accurately as possible, so it’s important to have a passion for words and strong language skills. Discipline, a strong work ethic, and a quest for knowledge are three key traits among successful court reporters. Court reporting requires a high level of technical performance, so an interest in cutting-edge technology is a plus. If you’re a procrastinator, then court reporting is probably not the direction for you. Great court reporters thrive under time and deadline pressures. Reporters must be exceptional listeners and have the ability to concentrate for long periods of time. Accuracy and attention to detail may impact a case and, ultimately, a life. History has shown that playing a musical instrument, particularly the piano, is another commonality in successful court reporters. How much does a career in court reporting pay? Just as anything else in life, what you get out of something is a product of the effort you put into it! As of January 2017, the median annual salary for a court reporter was $54,665, with an average range of $39,442 – $71,549. Reporters who have invested in continuing education, advanced certification, and cutting-edge technology typically earn well into six-figure salaries. It is also important to remember that there are different types of jobs for those who master the skills required to become a court reporter. A freelance court reporter is an independent court reporter or one who works for a court reporting firm whose work is primarily recording testimony taken in the discovery part of a case (depositions), as well as meetings, arbitrations, and hearings. An official court reporter is typically hired by a court system and works inside the courtroom. Interested in politics? Have you ever noticed the court reporter recording the proceedings of Congress or reporting the State of the Union address by the President of the United States on television? These are yet other opportunities for those who have the brains and the stamina to make it through court reporting school and to take their career to the greatest heights! And speaking of television, do you know how closed captions are generated? The captions for all live programming are generated by the amazing talents of a court reporter! What is the court reporting career outlook? Due to the aging workforce, there is a high demand for new court reporters. According to one expert, due to a 15% retirement rate, there is going to be a need for at least 5,500 new reporters from 2017 to 2022. The areas that are seeing the greatest demand are California, Texas, Illinois, New York and Washington DC. There has long been speculation that technology will take over the court reporter’s job. Until a machine can produce a verbatim transcript with 100% accuracy while two or more people speak at once (possibly with foreign accents!) AND is able to ignore side conversations, the profession is here to stay! If you are a court reporting student and thinking of joining our team, check out Planet Institute, our court reporter mentoring program. Are you an experienced court reporter looking for your next court reporting adventure? We’re hiring court reporters around the world. For more information on scheduling a court reporter, contact Planet Depos at 888.433.3767 or scheduling@planetdepos.com.